Factor or Divisor : A factor or divisor of a positive integer and it is divides it evenly parts of any positive integer ( i.e remainder is zero ). For example the factors of 12 are 1, 2,3,4,6 and 12. A common factors of “n1” and “n2” are the numbers. Now any number “x” is a factor of “n1” and also factor of “n2” then “x” is called common factor of n1 ans n2. 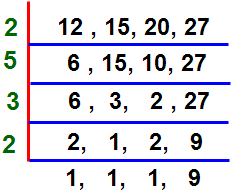 Ex: 6 is a common factor of 12 and 24. For example 2, 3,4,6,8,12 are divisors or factor of 24. The word ” divisible appears in a question, it means ” it divides equal parts or divisible without remainder. HCF of two or more than numbers is the greatest number (divisor) that divides all the given number exactly. So HCF is also called the greatest common divisor(GCD). Suppose If numbers n1 and n2 are exactly divisible by the same numbers x, than x is a common divisior of n1 and n2. Now highest number of all the common divisiors of n1 and n2 is called the GCD of HCF . For two no. n1 and n2 if n1 < n2 then HCF of n1 and n2 is always less than or equal to n1 . The greatest number by which n1, n2 and n3 completely divisible is the HCF of n1, n2 and n3. The greatest number by which x, y, z divisible and gives the remainder a, b and c is the HCF of (x –a), (y–b) and (z–c). The greatest number by which x, y and z divisible and gives same remainder in each case, that number is HCF of (x–y), (y–z) and (z–x). Let we have three numbers .Pick the smaller one and divide it by the larger one. After that divide the divisor with the remainder. This process of dividing the preceding number by the remainder will repeated until we got the zero as remainder.The last divisor is the required H.C.F. Find the HCF of 150,210 and 375. 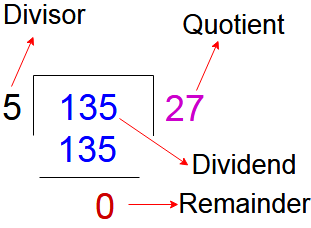 Step 2 : Division the number 375 by 150 than quotient 2 , dividend 300 and remainder 75. Step 3 : The divisior 150 comes to divident place and remainder 75 act as a divisor than here quotient comes 2 and remainder having “0”. 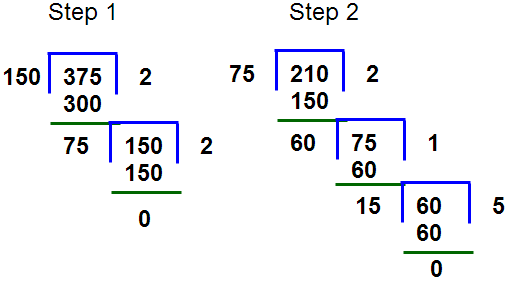 Step 4 : Now take numbers 75 and 210 than follow the above process until we got the remainder as zero. So Finally the HCF of the numbers 150, 210 & 375 is 15. Find the greatest number that will divided 640, 710 and 1526 so as to leave 11,7 &9 as a remainders respectively. Step 1 : Subtract all numbers with there respective remainders i.e 640-11=629, 710-7=703 and 1526-9=1517. So finally the HCF of the numbers 629,703,1517 is 37. Write out the all prime factors that are common to the standard forms of the numbers x and y. Find the greatest numbers which will divide 321, 428 and 535 exactly. LCM is the least dividend which is exactly divisible by given numbers. Suppose If numbers n1 and n2 are two numbers distinct from each other. The smallest natural number “x” that is exactly divisible by n1 and n2 than “x” is called least common multiple (LCM) of n1 and n2. For two numbers x and y if x < y, then L.C.M. of x and y is more than or equal to y. If ratio between two numbers is x : y and their H.C.F. is n, then their L.C.M. = xyn. The smallest number which is divided by x, y and z give remainder a, b and c, but (x – a) = (y – b) = (z – c) = n, then number is L.C.M. of (x, y and z) – n). The smallest number which is divided by x, y and z give remainder n in each case, then number is (L.C.M. of x, y and z) + n.
not divisible by any number except 1.The product of the divisor and the undivided numbers is the required L.C.M. Step 2 : Write each of the prime factors to their highest available power. 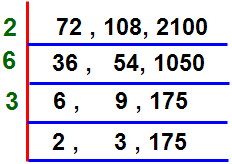 Step 3 : So LCM of the numbers 72, 108 & 2100 is 37800. 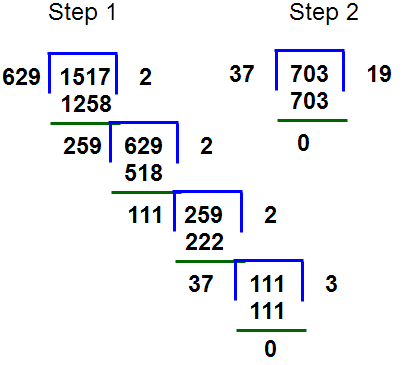 Step 3 : So LCM of the numbers 12, 15, 20 & 27 is 540. 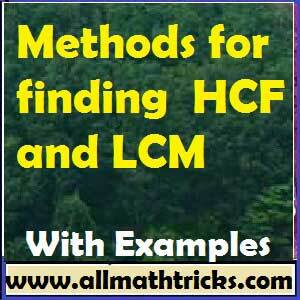 Formula for finding HCF and LCM of fractions. The LCM of two numbers is 936. If their HCF is 4 and one of the number is 72, then find the other number?